When the multilingual Ms. E and I took our “villa” (read: “part of a really old house”) in the south of France we left behind us many of the things that we took for granted here in America. Phone service, for one. We didn’t have a history of paying bills and so we weren’t eligible… Good Bourbon was really hard to find — even at a bar. Fortunately, great wines, champagnes and numerous cheeses were readily available. We adapted, cheerfully. The things that we thought we would miss, didn’t really become an issue. Until the Fourth of July rolled around. 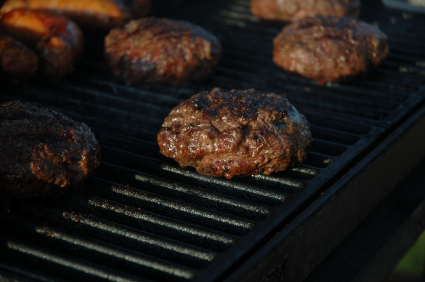 And what is the 4th without burgers on the grill? Vaguely un-American. And — as living for any length of time overseas will show you — our “Americaness” runs deep. So, we went shopping for burger makings. And along the way, I discovered what makes a really great cheeseburger: a little fat, and don’t mess with ’em too much. Which probably describes the French perception of Americans, too. That night, I cooked out on the grill. And we sang every patriotic song that we knew. It being summer at the beach in France, there was a fireworks display. And a quiet rendition of “The Star Spangled Banner” by the only two Americans for miles around. The French don’t age their meat as much as we do and you can tell the difference. That’s when I realized that the key ingredient is the meat… I’ve got a butcher, so I can get good ground meat. Use sirloin or chuck and make sure that it has at least 15% fat. That will keep them moist on the grill. Shape the meat into the burgers with a minimal of handling. Don’t make them too thick. And certainly don’t make them too thin. I’d say that mine run about 3/4″ to 1″ thick. Sprinkle them with sea salt and freshly ground pepper. And leave them alone. In about 4 or 5 minutes they will release from the grill and you can turn them. Cook for another 2 or 3 minutes, add your cheese (any kind will do, but if you’re adding American cheese — please, not “cheese food” — use two slices.) As long as the grill is heated you might as well toast the insides of your buns a little. Or you can use half of the buns to cover the cheese after you add it to the burgers. Ms. E likes her onion slices grilled. So I add them under the burger after I flip it. That’s it. You should have a rare to medium-rare, perfectly seasoned and delicious cheeseburger. Add whatever condiments you like — me? I’m a dijon mustard, onions, pickles, lettuce, tomato and jalapeño kind of guy. Happy Independence Day. And may God bless America. Ah, to have the opportunity to live in the South of France….but there’s just no way I could be separated from my dogs for that long! That burger recipe sounds delish. We’re going to a party today, & we’ve been told to bring nothing. That’s impossible – I may have been raised by wolves, but I couldn’t bear to do that! So, we’re bringing an Argentinian Sauvignon Blanc that comes highly recommended from 2 friends in the wine biz. We’re excited to try it! oh – how we miss an all american burger and fresh corn. we are going to fire up the grill once we are back in the states. guess we’ll have to have another moules frites! Hello Claire, we were pre-children and dog, it made it easier. What was the name of the wine? Always up for a new one. Thanks SC! And to you. Mrs. PvE, might as well wash it down with a Maas. (One of the few beers that Mrs. E. will drink.) Bon appetit! I am still chuckling over your sentence about how most French people would describe Americans. Probably accurate. Now I’m longing for a good cheeseburger. Of course, my grill is on my deck and the Piggly Wiggly is around the corner. I’d rather be in France. I remember longing for a burger and fresh corn when I was in Wales on the 4th… I made that cake with blueberries for stars and strawberries for stripes and lots of white icing. It took me ages to find an actual cake mix (god forbid I should do it from scratch). Hope your 4th wasn’t as rainy as ours was! Thank you Relyn. Ah, the Piggly Wiggly… be careful with the deck and the grill. I lit my grill on fire once under the porch roof. That would be the wooden porch roof. Hello Fairfax! What a fine sounding cake. Nope, it was about 1000ºF over the grill and under full sun. The rain came later, just before the fireworks. It was NQN Malma Sauvignon Blanc, & quite nice!